Today was Hawaii history day. Our first stop (after coffee, of course!) 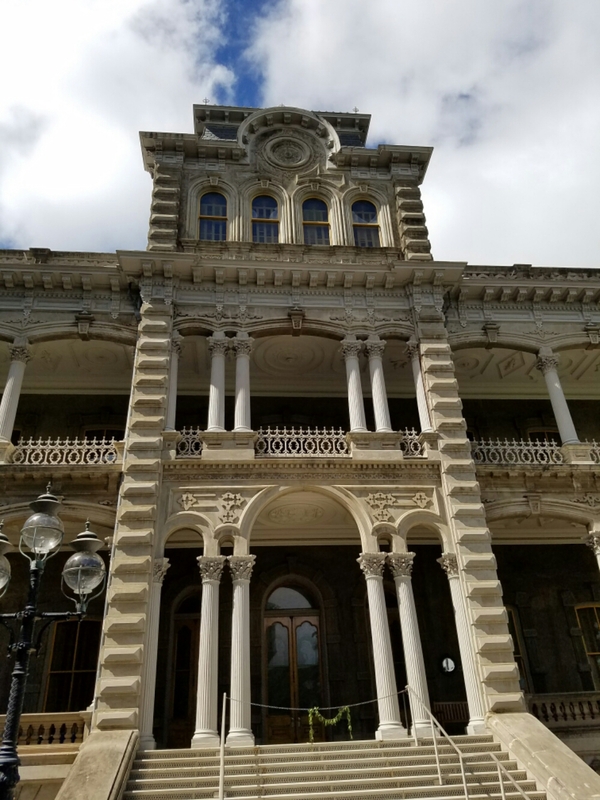 was Iolani Palace. We had to drive around the block a few times to find the entrance to the parking lot we’d spotted, only to find it was 30 minute only parking. Knowing that wouldn’t be near enough time, we found a public parking lot a few blocks away. We were able to get into the 10:30AM tour without a reservation, and had time to watch the video beforehand. I didn’t realize how much of Hawaiian history I had forgotten, or perhaps not been exposed to. Either way, each stop today was a stark reminder. 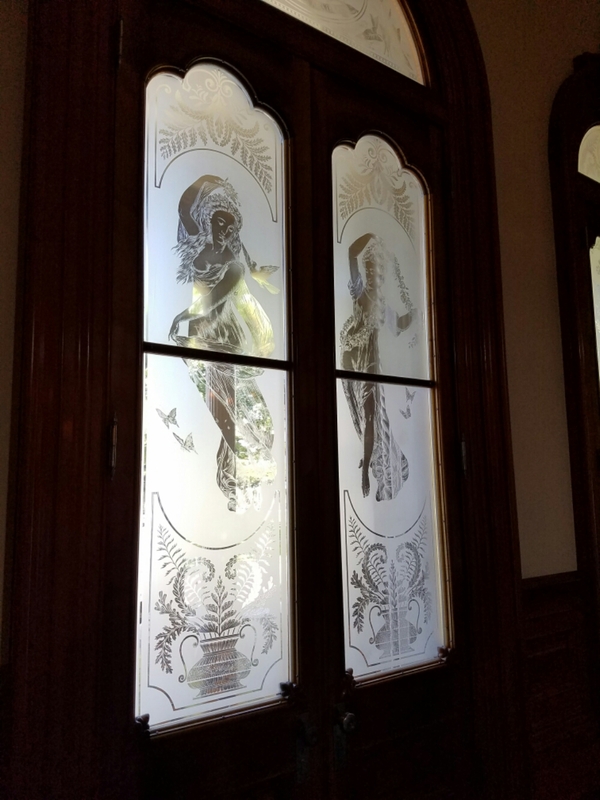 Iolani Palace is beautiful, and the tour (self-guided audio) does a good job at explaining the history of the monarchy and the history of the palace. 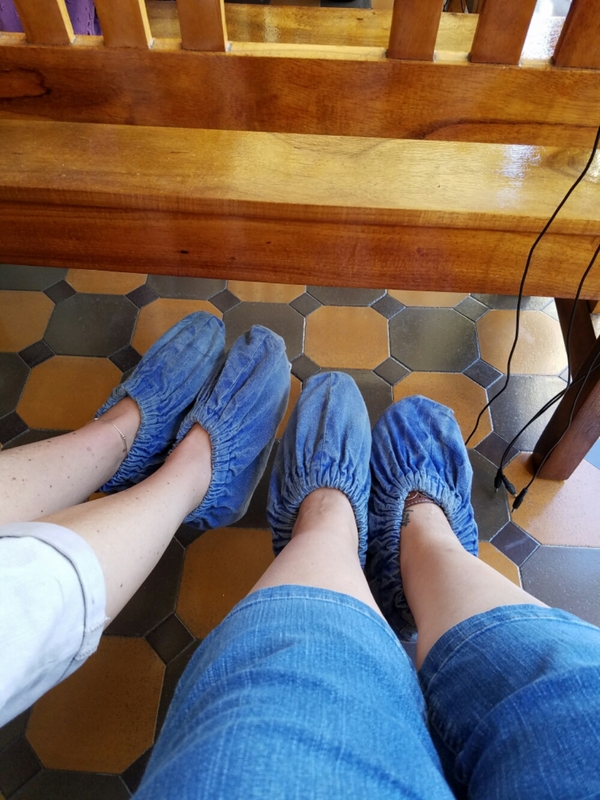 We put coverings over our shoes before entering the building, and toured the first and second floors. The basement is a gallery of photos and the kitchen. 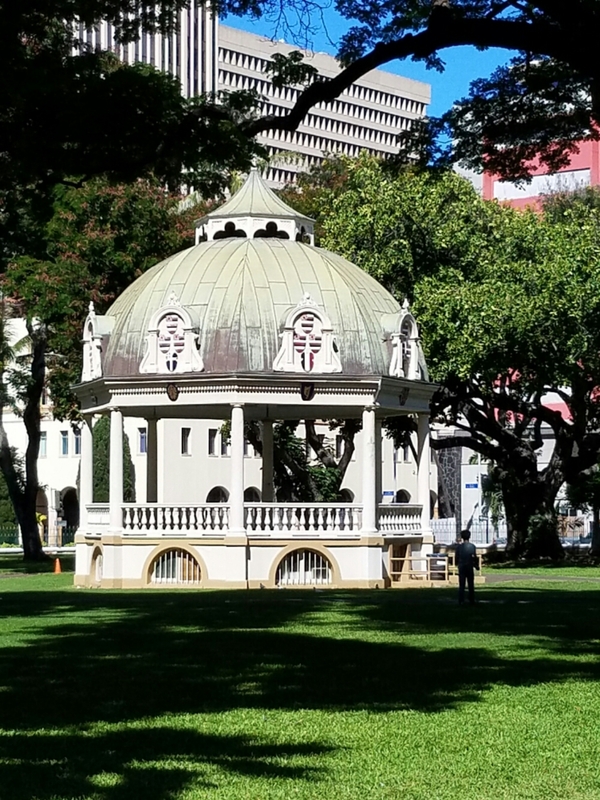 King Kalakaua built the palace in 1882 and had electric lights, a telephone and indoor plumbing long before it was fashionable. His sister, Queen Liliuokalani was actually imprisoned in a room within the palace. The latest in high-end fashion footwear! Hawaii was a very cultured and civilized society prior to the arrival of missionaries and US troops. Queen Liliuokalani and her sisters were guests at Queen Victoria’s jubliee celebration, and Hawaii appealed to Britain for sovereignty prior to annexation by the US. 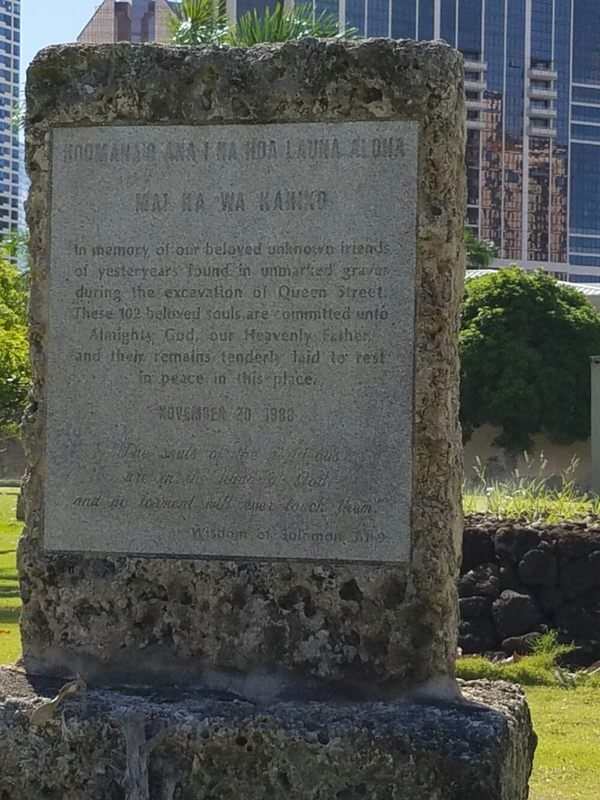 Despite attempts (by outside forces and monarchs) to stifle the Hawaiian heritage and traditions, they continue to this day thanks to the efforts of many. On our way back to the car we stopped at the Kawaiaha’o Church. 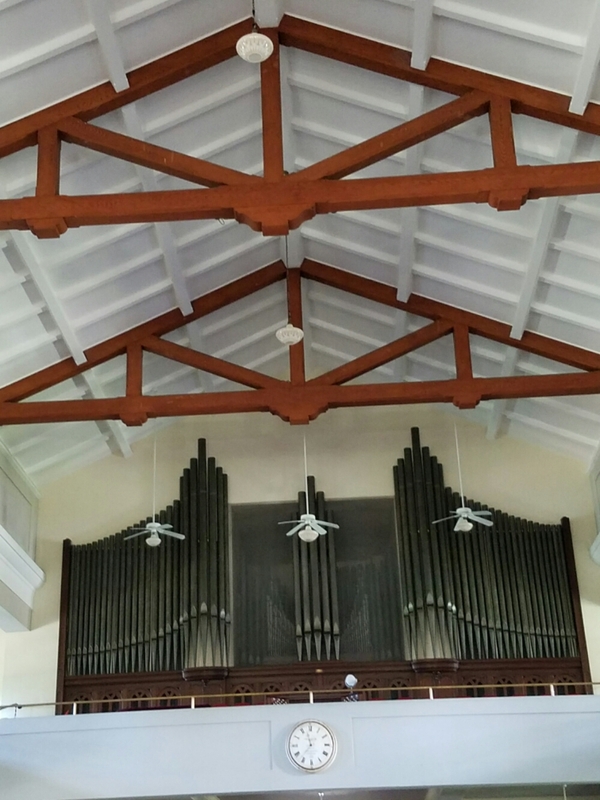 We’d passed by the cemetary on the back side on our way to Iolani Palace, but we took the time to look around the church grounds and inside on our way back. I wasn’t aware of the Vermont connection with Hawaii until today. I had to take a picture of the pipes for all my organist friends! Our next visit was Queen Emma’s Summer Palace. As we got out of the car we both commented on the cool breeze that blew through the trees – I’d also have chosen to go inland and upward to escape the heat of Honolulu, too! This was the family retreat, and there were many items belonging to Queen Emma on display. I had a wonderful conversation with two members of the Daughters of Hawaii. This organization runs the Summer Palace. We talked at length about growing up here many years ago, and how at home I have felt these past two weeks. They both said the island was calling me home, and I shouldn’t fight it. No debate as to whether we can or should, or even how…just do it, and if it is meant to be, it will be. (I can just imagine the look on my other half’s face when he greets me at the airport at 7AM on Saturday…Honey, I’m moving back to Oah’u, are you coming with me?!) D. will confirm that I have talked about moving back and feeling the “pull” since our first day. She will also confirm I have hatched many a plan as to how I can make the move work! From the Summer Palace we ventured to The Bishop’s Museum. It has areas that are interactive, and of course I channeled my inner child and played! If you want an intimate view of Hawaiian history over the centuries, spend a day here. We had limited time, so we did just one building. Incredible facts, figures, photos, relics and more about Hawaii history. We had hoped to return to Lucky Belly for lunch as we were very close to Chinatown. Alas, the clock was ticking, and we had just about an hour before we had to return the rental car. Last stop for the day, Punchbowl and the US National Cemetery of Hawaii. As with all national cemeteries (at least in my experience), it is a place of reverence, awe and beauty. May those laid to rest in these sacred places know eternal peace, and those who visit and tend to the sites find comfort. We dropped the car off with 5 minutes to spare, and headed back to our room to start the packing process. 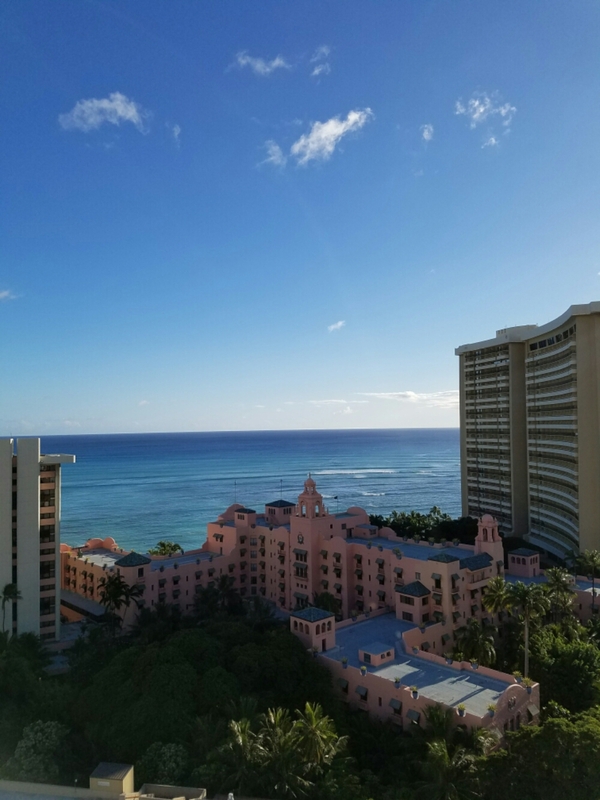 We struck out for a final walk on the strip and decided to finally stop at Sky Waikiki, a rooftop bar and restaurant, just below Top of Waikiki, a revolving restaurant. I do recall vague stories of my parents and friends being at Top of Waikiki, so it seemed appropriate that I check it out. 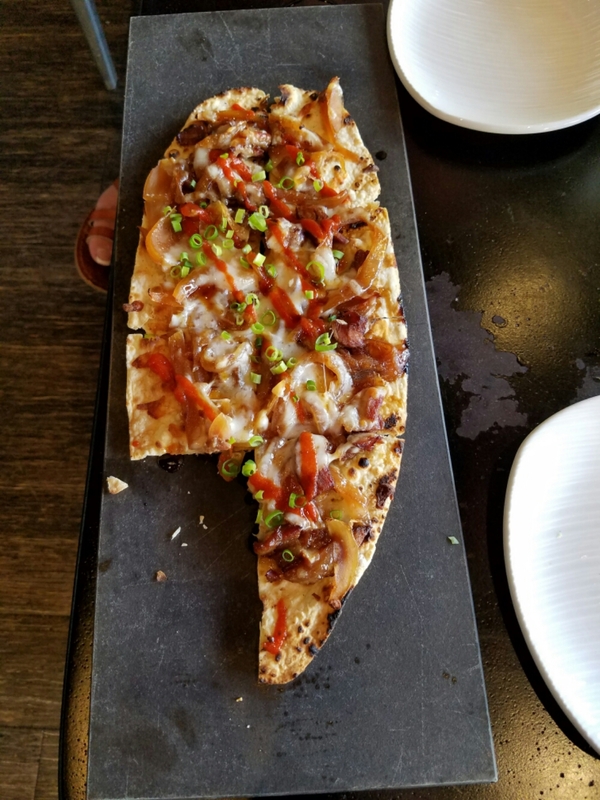 We shared a truly delicious appetizer of Big Island Smoked Pork Pizza. I had to sample it before taking a picture to ensure it was photo worthy and worth recommending – a big thumbs up to both! This is also apparently where they had the premier party for Hawaii Five-O recently. This was the hallway from the street to the elevator up to the 18th floor. A quick trip next door for last minute office gifts (we can’t go back completely empty handed to those who covered while we were gone for 2 weeks – they might not let us go again!) 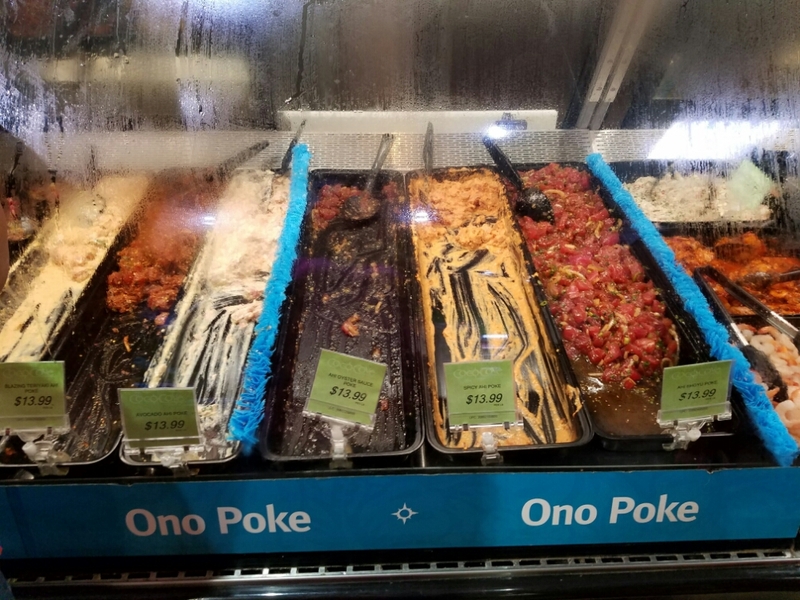 and a stop at the poke bar, and we headed back toward the room. 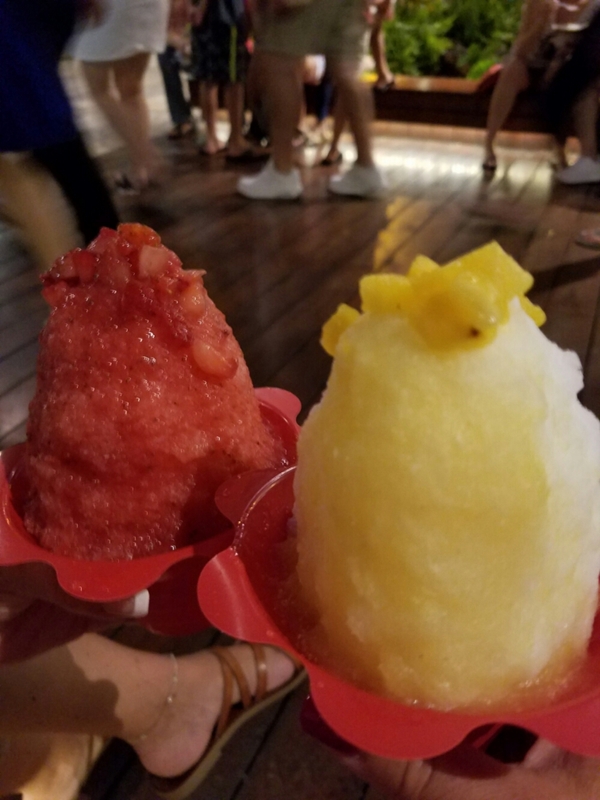 A visit to Hawaii wouldn’t be complete without a shave ice, and we finally indulged! It has been a wonderful visit. Hawaii, we leave you our aloha, and we take with us hearts full of aloha (and stomachs full of poke and suitcases full of gifts). Mahalo nui loa. Until we meet again!